What a day! 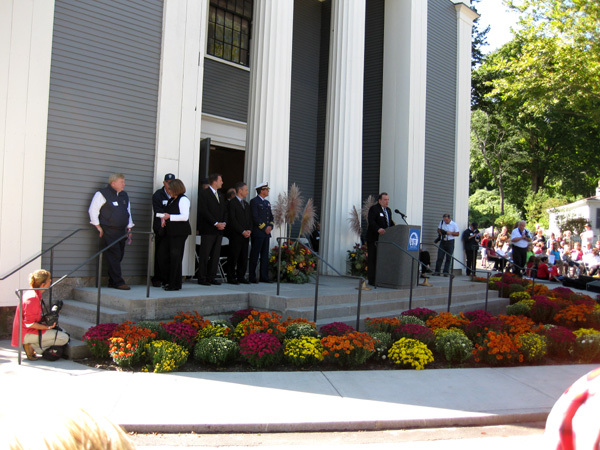 Saturday, October 2, 2010, was the long awaited re-dedication of the Sandwich Town Hall across the street from our Cape Cod Bed and Breakfast. 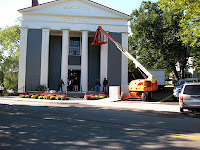 Friday afternoon we had torrential down pours that interrupted the last minute preparations for unveiling of the fully restored 1834 building. Overnight the weather cleared and from first light on Saturday, the contractor and town crews applied a last coat of paint and planted the finishing touches on the new landscaping in preparation for the noon ceremony. At noon, all was ready and ceremony began. Town Hall Square was filled with music from the Sandwich High School Jazz Ensemble. 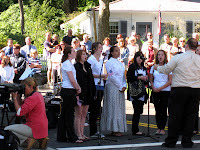 Boy Scouts Troop #47 posted the “colors” as the gathering of local town folks and fall tourist recited the Pledge of Allegiance and sang the National Anthem. Speakers highlighted the 176-year history of the building and recalled its significance in the Commonwealth of Massachusetts. 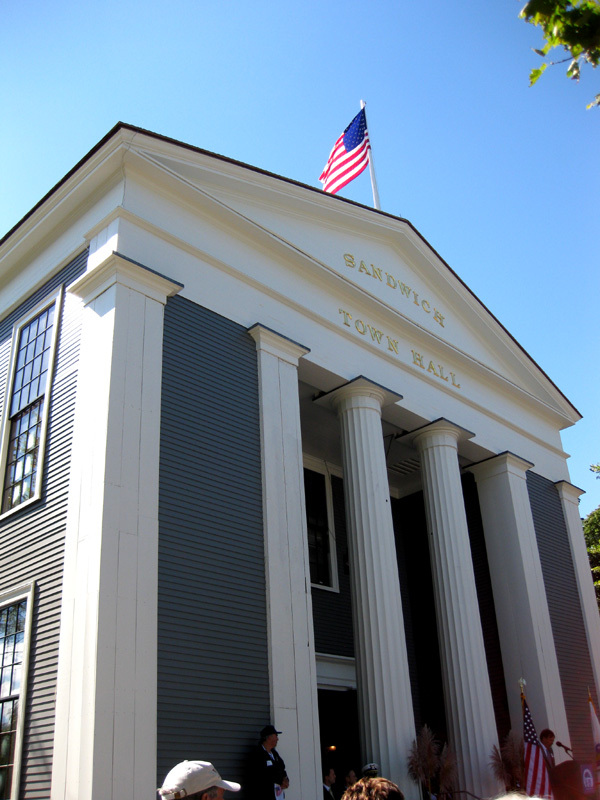 The Sandwich Town Hall is believed to be one of the first town halls completed to facilitate the concept of “separation of church and state”. 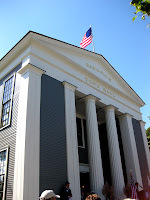 Prior to the completion of the new 1834 Town Hall, Sandwich town meeting and all town business was conducted in churches, usually the only structures large enough to accommodate the number of attendees. The original Town Hall specifications called for space to hold 500 town meeting attendees. Today, the unique “town meeting” form of local government continues, but now the meetings for the 2000 plus attendees are held in the high school auditorium with overflow seating viewing the proceedings via closed circuit TV. 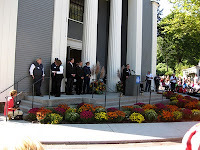 The program speakers included the towns elected officials and our state Senator and Representative. Many “resolutions and citations” from various governing bodies were read that recognized the achievement of the restoration of this historic place. 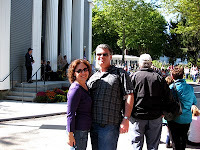 After the ceremony, we had a chance to tour the inside with two of our guest from California who enjoyed the history and small town feel that we love about Sandwich and not to be experienced in Los Angeles. I had not seen the inside of the building since the project started almost two years ago. The dingy and dark first floor workspace I remember visiting for town business has been replaced by refinished wood floors and bright brass fixtures. The last 176 years of wear and tear, and what had been considered “improvements,” have been stripped away and all has been returned to its original functional base but with all the modern upgrades to support the state-of the-art tools it takes to run an efficient government today. The most startling transformation was the second floor Meeting Hall. For decades, this had been used only for storage and was in complete disrepair. 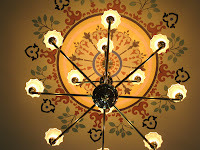 As work began, they uncovered some of the original intricate stenciling on the ceiling that was painstakingly restored. 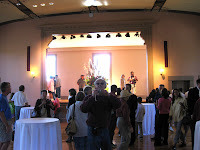 The fresh paint, shinning floors, and magnificent lighting and ceiling decorations are very impressive. We look forward to many functions in this great new meeting space, and are particularly proud to live in historic Sandwich Town Hall Square.